Here we go again – I’m writing this for two reasons. One, because this is my second attempt at the digest format. Two, because as I write this a thunderstorm is raging outside my house, a tiny and pale imitation of Hurricane Florence’s invasion of the Carolinas. The last time I stood in fear of a hurricane was when Irma hit Florida last year, passing over Orlando on its way through Georgia and on up the east coast. Irma was one of three especially fearsome hurricanes out of 2017; the other two being Harvey, which heavily destroyed Houston, and Maria, which wiped out Puerto Rico. Puerto Rico in particular will take years to fully recover, assuming no new equally destructive storms strike first. My heart as well as genuine prayers go out to the citizens of the Carolinas in harm’s way, especially those ill suited economically to recover from such a storm. And more lies will spew out of the Orange One’s mouth like maggots from a festering wound with regards to this storm as they did with Maria and Puerto Rico. 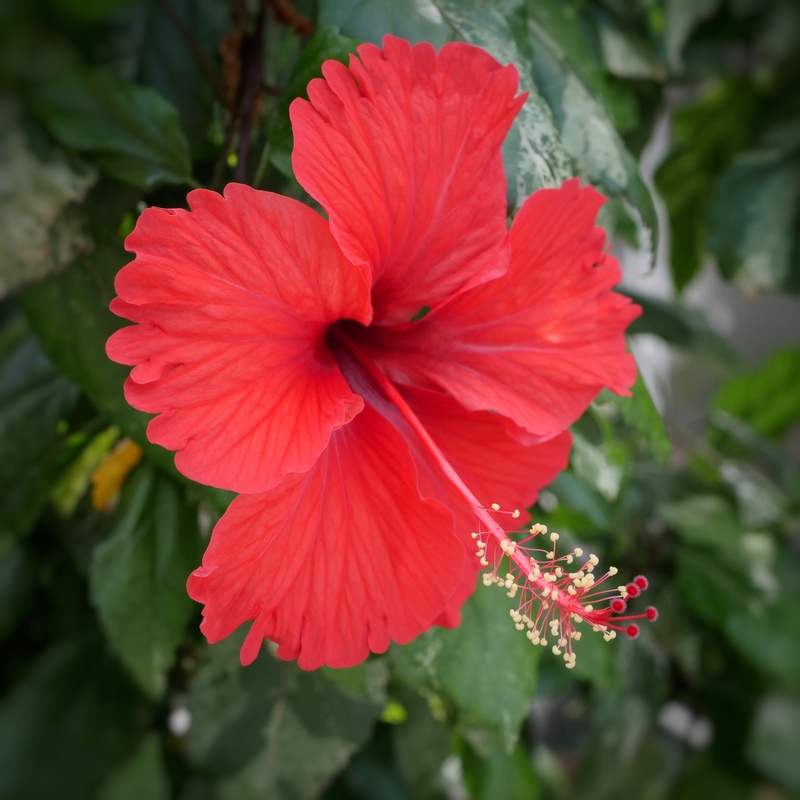 Rescuing a Hibiscus – I’ve been working in my back yard for some time now, converting it into a small flower garden primarily to attract and sustain butterflies. Many of the flowers I’ve purchased new over time, but some of them I’ve had growing for years, such as the miniature variegated hibiscus pictured above. Around the first of this year I repotted that plant from my back yard into a large pot with fresh potting soil, gave it a slow release fertilizer, and basically kept it close to the house in the screen covered area close to the pool. When it was repotted it had less than a dozen little leaves on it and the root system was pretty much gone. Over the last eight months it has slowly grown back to where it is entirely covered in foliage. And today I went out back to discover this one bloom on it, the first in I don’t know how many years. This one plant started out in a pot, and then I made the poor decision to plant it in the yard. It never really took to being a yard plant, and now that it’s back in a (bigger) pot than before, it’s thriving. I’m glad because this plant is over ten years old, and it covers a significant part of my personal history. I’m thinking that next season I’ll roll it outside to help attract butterflies. But it will remain potted until the day it truly dies. The new iPhones are here! The new iPhones are here! – I will never forget the scene from the movie “The Jerk” where Steve Martin’s character is excited to find his name, in print, in the phone book. I’ve been hit with multiple Apple emails to get ready to pre-order the new iPhone XS (which I pronounce “excess”) phones. I currently have an iPhone 8 Plus, which believe it or not, is more than good enough for me. I might not have the fastest iPhone anymore, but I still have the second fastest, and you know what? I’m OK with that. I don’t know if I’ll never get an iPhone Excess, but I believe I can certainly wait until maybe later next year to think about it. Right now I’m more excited about the imminent release of iOS 12. I’ve been beta testing it on my original iPad Pro 9.7″ model, and it really is faster than iOS 11. Hopefully it’s more bug free and consequently more stable than iOS 11. Only time and use will tell. The insanity of camera gear prices – In case you’re not a camera gearhead like me, Nikon and Canon both released so-called full frame mirrorless cameras, i.e. cameras that don’t have the flapping SLR mirror in front of their sensors. Those cameras are the Z6 and Z7 for Nikon and the EOS R for Canon. Both makers re-invented the lens mount, making all existing brand lenses obsolete with those new bodies, but not to worry! You can spend hundreds of extra dollars picking up an adapter to use that older glass. The biggest punch to the gut is the cost of these newest camera bodies, starting at $2,000 for the Z6 and going up to $3,500 for the Z7. The EOS R is “only” $2,300 for that body. And let’s not get started about lens costs. Nikon is on the low end starting around $600, with prices pushing up to over $3,000 for zooms from both Canon and Nikon. I personally will never own either camera nor any camera from either brand. I’m an egalitarian type of photographer who believes you shouldn’t have to spend the equivalent of a year’s rent just for the privilege of owning said cameras. I’m more in the several hundred dollar range for camera gear, like you could spend on the old Pentax K1000 or Minolta SRT-100 film cameras from decades ago. I predict this will drive more people to use the cameras that come on increasingly advancing smart phones, such as the just announced iPhone Excesses. I personally use Olympus micro four thirds, and I expect for that mount to slowly fade away. Which would be a real shame as there are a number of low-cost yet high quality Olympus (and yes, Panasonic) mirrorless interchangeable lens cameras that mere mortals can afford.